SFA is hosting an online scavenger hunt to celebrate the holiday season. Participants will have the opportunity to find a Free T-shirt Coupon Code on our website! Bigfoot CMMS Software can help you on a day-to-day basis: less downtime, more time for actual work, plus the peace of mind that comes with knowing you are in control. We are excited to announce the release of the latest Bigfoot read-only free trial. We encourage you to try out this amazing software for yourself! NTMA is an organization that works to create allies within the San Diego region of the local machining and tooling industry by fostering mutual success through education, technology and opportunity sharing. Being an active member in the community and in our industry is an important aspect of what we stand for. We appreciate the opportunity we had to present to our San Diego NTMA chapter in October. We would like to thank you for a great year of business. We strive to deliver the best in automation solutions and service. We value all of our customers and appreciate having the opportunity to deliver value through improving your efficiency and productivity. 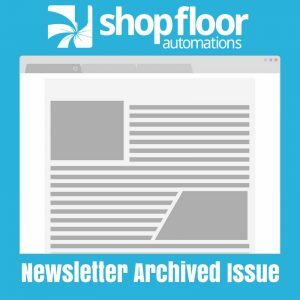 We believe that machine shop automation is the way of the future whether it be through Machine Monitoring, Computerized Maintenance Management Systems or Direct Numerical Control. These streamlined solutions have the capabilities to save shop’s time, money and headaches. High quality, application specific RS232 cables are an essential component in any reliable shop floor communication network. We have put together a system that provides customers with an entire cable solution. Our line of serial port adapters can accommodate any combination of CNC controls and different computer ports. Customize RS232 cables to work specifically for your shop’s needs in three easy steps: Choose the length you need, select your CNC Control then pick your computer. We will develop a custom cable configuration just for your specifications. We are so confident that you will love our RS232 cable solutions that we are giving you 10% off a RS232 cable purchase. Use the coupon code “CABLEGUY” to receive your discount.